No more fears over trees far apart. Hang more than 30" apart with our Roo Double, Python 15 straps, and Python Extenders. Each Python strap offers 15" feet of adjustable length in our Go the Distance Kit. Unique, high-tenacity Gravitas™ diamond ripstop nylon protects against tearing and ripping, resulting in the highest weight capacity (500 lb) of any hammock in its category. Add over 9 feet of length to your Python Straps and extend your options for places to hammock camp. The loops on the end of each strap are sewn to remain open, making it a cinch to feed the ends through each other when reaching around a tree. 2"-wide flat polyester webbing displaces pressure on trees and minimizes a hammock camper's footprint on nature. Keep tree bark safe and park rangers happy with this additional tree protection. W 4.5" × H 2.5"
W 3.5" × H 4"
Do I need to order Python 15s with my hammock? Straps are not included with your hammock purchase but you'll need some to hang. If you don’t already have straps, make sure to pick up a pair of Python 15s with your hammock purchase. Are Python 15s tree friendly? 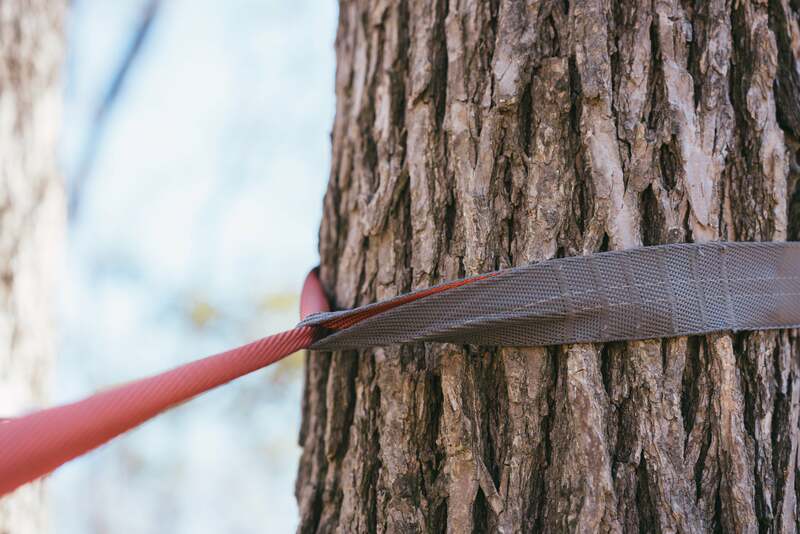 Thousands of trees are damaged every year from chain or rope straps that strip tree bark and wear into the outside of the trunk. Kammok Python 15s are designed with variable width polyester webbing (from 1.5" to .75") that displaces pressure on trees and minimizes a hammock camper's footprint on nature. You can also add a pair of Python Extenders, whose 2-inch width means they provide ultimate tree protection and meet most park requirements on hammock straps. How much weight can Python 15s support? Python 15s can hold up to 500 lb per strap. Can I use my Python 15s with non-Kammok hammocks? Kammok Python 15s work with any hammock that uses carabiners to suspend. However, 10 out of 10 would recommend pairing with a Kammok hammock. We recommend you hand wash your Python 15s with a small amount of gentle soap in warm water. How much weight can Python Extenders support? Python Extenders can hold up to 500 lb per strap. Do Python Extenders work with non-Kammok straps? Yes, our Python Extenders will work with the majority of traditional hammock suspension systems currently available.